This sepia colored photograph shows the Gillette & Nicholson lumber yard at 100 Kansas Avenue, across from the Rock Island Depot in Topeka, Kansas. 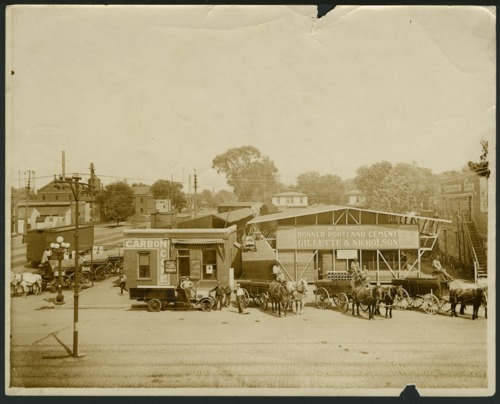 Horse drawn wagons and one truck are lined up in front and to the side of the business. The wagons to the left side of the building appear to be some sort of tanks for hauling liquids. Various signs indicate that they sell Bonner Portland cement, coal, lumber, carbon, and coke.